The Microsoft Corporation offers numerous products that make a unified set of business solutions based upon the business requirements for almost all kinds of enterprises and industries. A good team of Microsoft Dynamics developers, SharePoint programmers, warehouse developers and SQL server administrators can implement the best solution based upon the Microsoft platforms, tools and applications for any kinds of businesses. All versions of the Microsoft Dynamics platform, such as MS Dynamics GP, AX and NAV have the capabilities to integrate different tools and applications – from Microsoft as well as from the company partners – to create a custom business solution for sizes of enterprises. A reliable, robust and professional grade data warehouse management system can also be developed with the wide range of Microsoft products, platforms, apps and tools. The major Microsoft products commonly used in the data warehouse development include, MS Dynamics, MS SharePoint, MS SQL Server, MS Azure, MS Office 365 and others. The most popular data warehousing solution of Microsoft Corporation is known as an Azure SQL Data Warehouse, which is a cloud based data warehousing solution for enterprises. Let’s talk more about the Microsoft warehouse development and data warehouse developer skills in this article. The development of Microsoft data warehouse requires the skilled and technically knowledgeable data warehouse developer, consultants and data warehouse analysts to develop high quality data warehousing solutions. The SQL server is the core component of the Microsoft data warehousing platform that has capabilities of data storage design, analysis and testing of big data. It is one of the highly secure and reliable data storage solutions available in the marketplace. It can also be implemented with the Microsoft Software development, collaboration and reporting tools like MS SharePoint, MS Dynamics, Office 365 and others. You can customize your data warehousing solution by developing custom tools and applications with the help of an expert warehouse programmer and implement in the warehouse management platform. The data warehouse engineer can also help in improving the customized use of the warehouse management system by integrating the new tools from the Microsoft partners in the marketplace. So, we can say that Microsoft offers a complete software development solution for all kinds of software tools that support many kinds of IT functionalities and capabilities, including warehouse development, visual studio development along with Visual Studio developers, SharePoint development and many more. What software development platform should be used for warehouse development depends upon the skills of the data warehouse experts and warehouse coders. There are many data warehouse development platforms that a warehouse engineer can choose; for instance, Teradata, Informatica, and many others. Generally speaking, the companies choose the warehouse solution that is comprehensive, rich-featured, easy to maintain, intuitive to learn and powered by the great community to support. Among such warehouse solutions, the Microsoft warehouse solution is very well known for its unified nature of solutions and support. 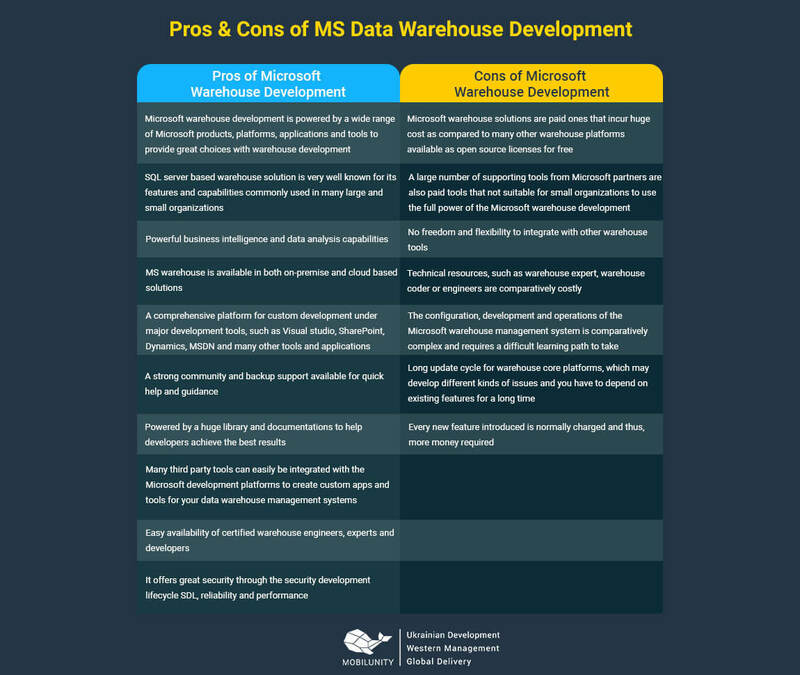 Let’s have a look at the pros and cons of using Microsoft data warehouse development platform. In the present data warehouse industry, there are numerous tools that are used by different companies to run their data warehousing management systems. The top 5 warehouse tools are described with details below. 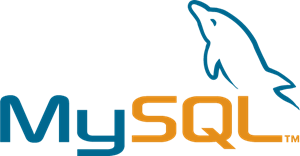 MySQL database solution is an open-source data management software system powered by the support, distribution and development of Oracle Corporation. It is a rational database management system with the following main features. 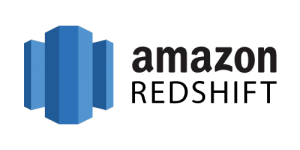 Amazon Redshift is a fully managed data warehouse tool. It is used for big data analysis and business intelligence purposes. It is a highly efficient and cost effective data processing solution. It has numerous features as mentioned below. The skills of a warehouse developer depend upon the platforms, tools and apps used for a particular job position. In general, a good warehouse developer should have the following skills to grab better job opportunities in the marketplace. A good sample of a warehouse developer should include technical skills, relevant experience and required academic qualifications. The level of job title will determine the depth of expertise and experience for that particular position. For a mid level career of a warehouse developer should have the following skills, experience and education. Why to Hire Warehouse Developers Remotely and How? The software development industry is extensively adopting the concept of remote hiring in all domains of software development projects. There are many good reasons to do so. The main reasons include reduced development cost, improved team efficiency, access to highly talented resources and reduced burden of human resources management. The remote warehouse developers accomplish the development task more effectively and efficiently within the budget limits. The remote developers are cheaper than the local hiring of warehouse developers. The Mobilunity remote warehouse developer service is one the best providers of remote warehouse developers’ service in Ukraine at very affordable cost. The Mobilunity provides dedicated remote warehouse developers to its clients at fixed prices without any hidden charges. It also manages entire human resource management process and provides the professional grade work space and required infrastructure for warehouse development remotely. Contact us now to hire highly skilled, qualified and experienced data Warehouse developers dedicatedly!